Luke Willingham submitted this photo and caption. This is the 2009 Bluecoats snare drum line from the Winter Guard International Finals (with staff tech). 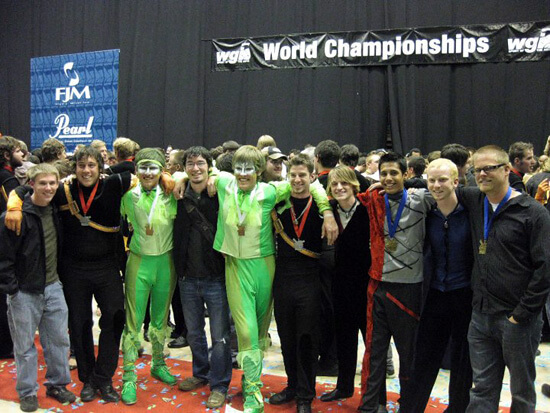 Josh Bollman (Rhythm X alumni '08, '09), Aaron Barrientos (Rhythm X), Luke Willingham (Music City Mystique), Jeremiah Salisbury (Tyler Junior College '08), Drew Guy (Music City Mystique), Zac Bernard (Rhythm X), Collin Pagel (Tyler Junior College), Nathan Medina (Pulse Percussion), and Richard Eathorne (Redline), along with snare tech Eric Shriver (Pulse Percussion). Pulse took home the gold medal, Rhythm X was silver and Music City Mystique took bronze.